We all enjoy holidays in sunnier climes but, sadly, the sun’s rays also take their toll on your hair, leaving it rather worse for wear. That’s why it’s important to give it a much-needed post-holiday treat. Here, Paula has tested some of the latest hair products on offer. A moisturising and strengthening shampoo to restore softness to damaged, dry or coloured hair. Moroccan Argan Oil helps repair and protect whilst adding shine. Price: £3.50, available exclusively at Sainsbury’s (Vegan-friendly). A lightweight conditioner containing coconut water. Designed to lock in moisture and detangle, aiding styling. Price: £3.50, available exclusively at Sainsbury’s (Vegan-friendly). Our Verdict: This was the first time I’d tried a ‘leave in’ conditioner so was a little unsure about it. The product certainly spread through my hair well and was very easy to comb through. However, I found that it took rather longer than usual to dry and by the next day, it did feel a little greasy. This treat for your hair nourishes and moisturises for a knock-out shine. Price: £3.50, available exclusively to Sainsbury’s (Vegan-friendly). Our Verdict: The packet recommends leaving on for 15 mins for best results. However, after just five minutes my hair was tangle-free and very soft upon drying. The root area was very smooth although there was a little dryness remaining at the ends. The extra 10 minutes treatment time would probably have made the difference but, overall, I was impressed. 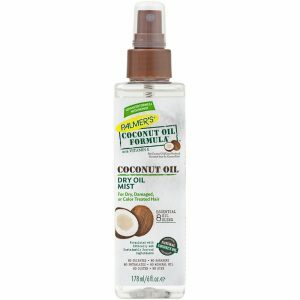 This lightweight spray combines the strengthening power of keratin protein with a blend of eight essential hair oils, including pure coconut oil, avocado oil and grape seed oil. It enhances shine, combats frizz as well as moisturising the hair and scalp. Price: £6.99, available at Superdrug & Feel Unique. Our Verdict: As with any spray, this was difficult to spray evenly and from far enough distance without covering the surroundings! Initially, it gave a wet look but dried quite quickly. Good shiny finish but not sure about taming frizz. Best of all was the lovely smell. This spray contains eight hair oils and aims to enhance shine and combat frizz while moisturising the hair and scalp. Price: £6.99, available at Superdrug & Feel Unique. Our Verdict: The smell was lovely. It sprayed on as a dry mist but felt a little like using hairspray. The deep cleansing properties of artichoke remove mineral deposits, which can cause dullness, whilst also protecting the cuticles in the hair shaft resulting in smooth frizz-free locks. The quinoa coats the hair shaft giving body for a thicker, fuller look. Price: £14.95 (200ml), £9.95 (100ml). You can purchase direct at www.greenpeople.co.uk. Our Verdict: Packaging says to use a small amount and that was all you needed to create a very good lather. Didn’t find it volumising but that wouldn’t put me off buying it. Quinoa and artichoke preserve the surface of the hair, leaving both natural and coloured hair with high shine. Studies on quinoa protein show that shine increases by 50% after just five washes; it also enhances softness and increases manageability. The artichoke leaf boasts high levels of antioxidant helping to repair damage caused by UV exposure. Price: £14.95 (200ml) £9.99 (100ml). You can purchase direct at www.greenpeople.co.uk. Our Verdict: Very soft on application and dried well leaving a smooth feel to my hair. Did have a slight feeling of residue but still very impressed with this product. 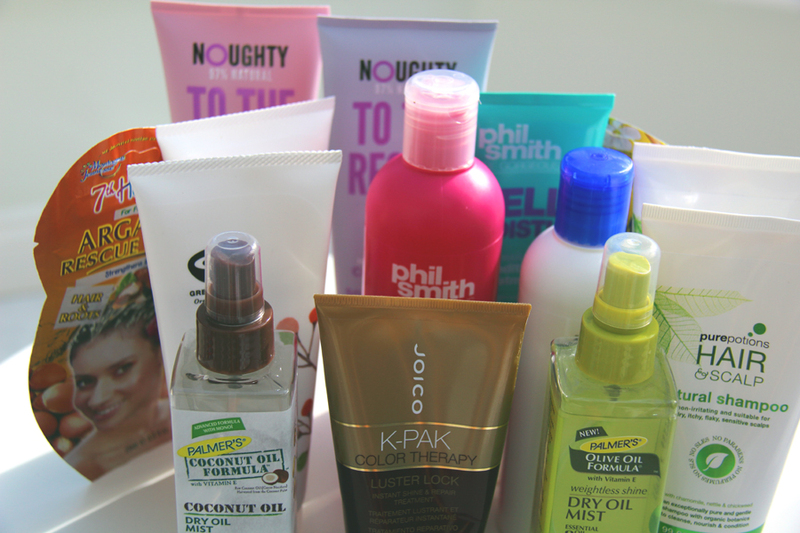 The Noughty range contains no parabens, sulphates, petrochemicals or silicones and is vegan and vegetarian-friendly. This 97% natural, intensely moisturising shampoo with almond and sunflower seed extracts helps transform split ends and frizz. Price: £6.99, available at Superdrug (in-store & online). Our Verdict: Pleasant smell although I did find it a little difficult to obtain a good lather, even though we have very soft water in our area. The packaging does, however, mention better results are obtained from a second wash so they seem to be aware of this. This product is 97% natural and with quenching shea butter and argan oil the conditioner both nourishes and protects, leaving hair stronger for longer. Price: £6.99, available at Superdrug (in-store & online). Our Verdict: Quite a lot a product was needed and I didn’t get that silky feel when applying, although this may be due to the natural ingredients. However, upon drying my hair had a nice shine and a pleasantly soft feel so, overall, pleased with the result. Pure Potions is all about being natural. The company prides itself on producing products suitable for everyone, including babies as young as six weeks and anyone prone to skin allergies. This is a mild, unperfumed, soap-free and SLS-free shampoo. It’s especially good for sensitive skin with its ingredients feeding the scalp and the cleansers lifting dirt from the hair without stripping it of natural oils. Price: £18 direct from www.purepotions.co.uk or offers may be available from QVC. Our Verdict: As the packaging states, you won’t get a lot of lather because of the natural ingredients. However, I also found the product fairly rough as I applied it with my hair feeling quite course at that stage. This conditioner is designed to nourish sensitive scalps with its deeply hydrating and nutrient-rich organic hemp seed oil. It also contains growth-boosting argenine and silky-feeling, ultra nourishing oats. 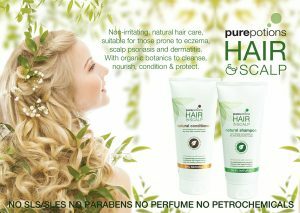 Price: £18 direct from www.purepotions.co.uk or offers may be available from QVC. Our Verdict: The packaging advises you to expect less glide due to the natural ingredients and that certainly was the case. I found it difficult to spread and, therefore, used quite a lot. In my experience, it wasn’t particularly tangle-free on combing but dried to a fairly smooth finish. The company also produces a Skin Salvation Scalp Oil. This 100% natural blend of anti-microbial, organic conditioning oils aims to soothe sore, itchy scalps, leaving hair soft and shiny. It can be applied overnight then washed off in the morning. This treatment aims to rescue even the most lifeless hair while colour-treated hair is left nine times stronger. 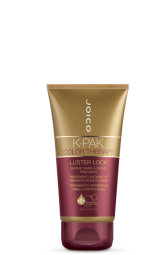 Its secret is two of JOICO’s ingredient breakthroughs: an exclusive blend of hair identical keratins repair from the inside while quick-absorbing Africal Manketti and argan oils replenish lost lipids whilst “super” polymers resurface the hair’s cuticles, creating a seal to lock in colour and shine. Price: £6.20 (50ml), £17.45 (140ml) & £27.95 (500ml). Our Verdict: This gentle smelling product was quite thick but still easy to spread, leaving my hair feeling very smooth as I rinsed. My hair combed through easily after use and upon drying was very soft and shiny. The company’s products are completely natural and cruelty-free. 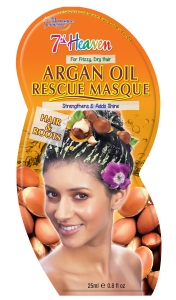 The product is referred to as a helping hand to tame frizz and promote shine with nutrient and vitamin rich argan oil and panthenol. Price: £1, available direct from www.my7thheaven.com, Amazon, Wilko, Primark and other retailers. Our Verdict: Great results; only downside is how difficult it is extracting the cream from the packet once your hands are wet! Organic Argan Fresh Coconut TLC is described as excellent for repairing damaged hair. 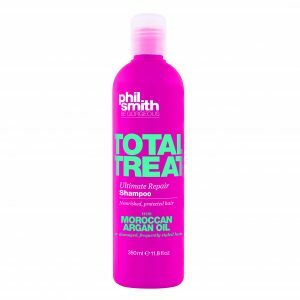 A unique formulation of intensive virgin coconut and argan oils provides hyrdration and essential active nutrients to reduce protein loss and strengthen hair, leaving it soft, glossy and revitalised. 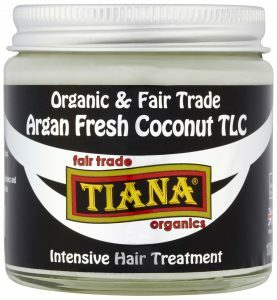 For further information on this product and others produced by TIANA, visit www.tiana-coconut.com. 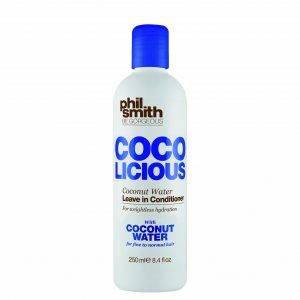 Our Verdict: We love the freshness of coconut so were keen to test out this product. The treatment requires a bit of time and effort to really reap the benefits. Results were good and my hair was left soft and shiny, but isn’t ideal for anyone in a rush. As it remains solid below 25 degrees, you have to warm the cream in order to apply it and then leave it on for at least 20 minutes or, ideally, overnight before shampooing as normal. But if this isn’t a problem, give it a try because you’ll be pleased with the results.